Following a history in the fashion business that dates back to the 1960’s, Betsey Johnson launched its jewelry line in 2006. 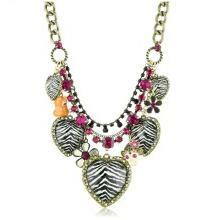 Betsey Johnson jewelry is designed in keeping with the rocker-meets-red-carpet style of its well-known clothing brand. Famous for outrageous and energetic designs, Betsey Johnson makes jewelry that is whimsical, eclectic, and always on-trend. Betsey Johnson jewelry takes every little girl’s princess-like dream and makes it a reality for women. With lots of pink, gold, sparkling stones, and glossy pearls, the line makes classic jewelry into funky pieces of wearable art. Betsey Johnson jewelry always centers on themes inspired by its customers–whatever shoppers love right this minute is what makes a great collection. Expect to turn heads when you wear these bold pieces out on the town.